Figure 1. A, Number of pulmonary metastatic lesions detected by preoperative imaging. B, Number of pulmonary metastatic lesions detected through visual inspection and manual palpation and confirmed by pathology. C, Percentage of missed lesions by pulmonary lobe. Figure 2. Percentage of cases per year in which intraoperative palpation and/or visual inspection of lung parenchyma identified pulmonary metastases not detected during preoperative computed tomographic imaging of the chest. Is Palpation in the Operating Room the Best Method for Surgical Planning? Hypothesis Preoperative imaging underestimates the number of pulmonary melanoma metastases. Although thoracoscopic resection is less invasive than resection via thoracotomy, it does not allow manual palpation of the lung to identify any metastases not visible on the preoperative scan or at the time of resection. Design Retrospective review of a prospectively maintained database. Patients A total of 170 patients who underwent preoperative computed tomography of the chest, followed within 30 days by thoracotomy for resection of pulmonary metastatic melanoma. Main Outcome Measures Number of pathology-confirmed pulmonary metastases detected by preoperative chest computed tomography vs intraoperative manual palpation. Results The mean age of the patients was 49.5 years at initial diagnosis of melanoma and 57.1 years at diagnosis of pulmonary metastases; 69% of patients were male. A total of 334 pulmonary metastases were resected; the mean lesion size was 2.0 cm (range, 0.1-14.0 cm). In 49 of 190 pulmonary resections (26%), manual palpation of the subpleural parenchyma revealed lesions not identified during preoperative imaging. The rate of 5-year overall survival was 33%. Conclusions Preoperative imaging underestimates the number of pulmonary lesions in patients with metastatic melanoma. Because incomplete resection of metastatic disease is associated with worse outcomes, we recommend caution when considering a minimally invasive approach for the resection of pulmonary metastatic melanoma. The first planned pulmonary metastasectomy was performed in 1927 by G. Divis in Europe and then in 1939 by J. Barney and C. Churchill in North America.1 Drs Barney and Churchill performed a lobectomy for a pulmonary renal cell metastasis; the postoperative disease-free interval exceeded 20 years.2,3 Subsequent studies1,2,4-9 have reported long-term survival after pulmonary metastasectomy for various malignancies in appropriately selected patients. Most pulmonary metastases in patients with melanoma are detected by computed tomography (CT) of the chest.6,13 Increased numbers of patients are being referred for minimally invasive techniques to resect lesions detected on CT scans.13 Although these minimally invasive techniques can decrease postoperative pain and hospital stay, they rely heavily on preoperative imaging.14 In contrast, bimanual palpation of the lung parenchyma to detect additional metastatic lesions can only be achieved via a thoracotomy. Although the resolution of CT images has improved dramatically over the last few decades, we hypothesize that preoperative CT cannot detect all lesions identified during intraoperative manual palpation of the lung parenchyma. The purpose of our study was to examine differences between the number of lesions reported on preoperative chest CT scans and the number of lesions detected by manual palpation and visual inspection of the lung parenchyma during surgery and confirmed by pathology. The melanoma database at the John Wayne Cancer Institute in Santa Monica, California, was analyzed to identify patients who underwent thoracotomy and resection for pulmonary metastatic melanoma from 1994 to 2010. We excluded any patient who had not undergone CT scanning within 30 days before thoracotomy and any patient whose pathology and radiology reports were not available. At the John Wayne Cancer Institute, the selection of patients for pulmonary metastasectomy is based on previously published criteria, including complete treatment of the primary melanoma.1,4 Standard preoperative workup involves CT of the chest, abdomen, and pelvis and magnetic resonance imaging of the brain. Whole-body positron emission tomography is sometimes included, but our experience confirms previous reports that this technique is more useful for the detection of larger (>5 mm) metastatic lesions.15 Patients with evidence of unresectable extrathoracic disease are referred for systemic therapy instead of metastasectomy.5,12,13 All surgical candidates must demonstrate adequate cardiopulmonary reserve and the ability to tolerate the operative procedure. Data regarding patient demographics, primary tumor site, radiographic findings, intraoperative findings, and pathologic analysis were retrieved for analysis. The number of lesions identified during preoperative imaging was compared with the number of lesions identified during metastasectomy for each case, for each year, and for the entire study period. The t test or χ2 analysis was used to compare patient-related and tumor-related factors based on radiographic and pathologic findings. P < .05 was considered statistically significant. Our study was reviewed and determined to be exempt from institutional review board approval. During the study period, 170 eligible patients underwent pulmonary resections for metastatic melanoma; 117 patients (69%) were men, and 53 (31%) were women. The mean age at initial melanoma diagnosis was 49.5 years. Of the 170 primary melanomas, 50 (29%) were on the head or neck, 53 (31%) were on the trunk, 17 (10%) were on the upper extremity, 20 (12%) were on the lower extremity, and 30 (18%) were unknown. The primary melanomas had a mean Breslow thickness of 2.55 mm; 21 (12%) primary melanomas were ulcerated. The median interval between initial diagnosis of melanoma and pulmonary resection was 58 months. The mean age at pulmonary resection was 57.1 years (Table). All pulmonary metastasectomies were performed via a thoracotomy incision or median sternotomy in patients with disease in both lungs. The median length of hospital stay after pulmonary metastasectomy was 4 days (range, 2-14 days). The 170 patients underwent 190 elective pulmonary resections to remove 262 lesions identified during preoperative chest CT (Figure 1A). During 49 of the 190 operative procedures (26%), additional lesions were detected by manual palpation and/or visual inspection of the subpleural parenchyma. The number of additional lesions detected visually vs manually was not recorded in the operative record. Final pathology reports indicated that 334 pulmonary metastatic melanoma lesions were excised during the 190 procedures (Figure 1B). Intraoperative detection of additional lesions was directly correlated with the number of preoperatively imaged lesions (the mean [SD] number of lesions detected was 2.0 [0.4] for cases with additional lesions vs 1.2 [0.5] for cases with no additional lesions [P = .001]). More surprisingly, intraoperative detection of additional lesions was inversely correlated with the diameter of preoperatively imaged lesions (the mean [SD] diameter of lesions was 1.5 [0.3] cm for cases with additional lesions vs 2.2 [0.4] cm for cases with no additional lesions [P = .003]). The mean diameter of a missed lesion (detected lesions missed by preoperative imaging) was 0.5 cm. A lesion was detected in a different lobe of lung in 33% of cases in which additional lesions were found. As shown in Figure 2, the rate of missed lesions did not appear to decrease during the study period. The 5-year overall survival rate was 33%, with a median time from pulmonary resection to death of 17 months. Previous study groups16,17 have compared detection of pulmonary metastases by preoperative chest CT vs bimanual palpation. Parsons et al18 performed a retrospective review of 34 patients who underwent 41 pulmonary resections for metastases from various cancers. The most common cancer was osteosarcoma. Two patients with metastatic melanoma were included in this study.18 Of the 41 patients, 9 (22%) had additional malignant nodules detected during intraoperative bimanual palpation.18 Similar results were reported by Cerfolio et al19; in their prospective study of 152 patients, 51 (34%) had 57 pulmonary nodules that were not imaged preoperatively, and 32 of the 57 nodules (56%) were malignant. Advocates for thoracoscopic pulmonary metastasectomy have argued that, although this technique does rely heavily on preoperative imaging, lesions not detected during preoperative imaging will eventually be detected and resected. However, Ellis et al20 performed a retrospective review of patients who underwent metastasectomy via thoracoscopy vs thoracotomy. Although the number of lesions detected during preoperative imaging was not significantly different between patients who underwent thoracoscopy and patients who underwent thoracotomy, the number of resected lesions was significantly higher in the thoracotomy group. In addition, Mutsaerts et al16 prospectively studied 28 patients enrolled in a trial of thoracoscopic resection followed immediately by confirmatory thoracotomy. Of 17 patients who were able to undergo both procedures, 5 had residual disease demonstrated by confirmatory thoracotomy. In a follow-up study examining long-term survival, Mutsaerts et al21 compared 19 patients undergoing metastasectomy via thoracotomy with12 patients undergoing thoracoscopic metastasectomy. Three patients with melanoma were included in this study.21 The rates of complications were higher in the thoracotomy group than in the thoracoscopy group (5 vs 0; P = .049). There was no difference in the 2-year overall survival rate between the thoracoscopy and thoracotomy groups (67% vs 70%; P = .85). 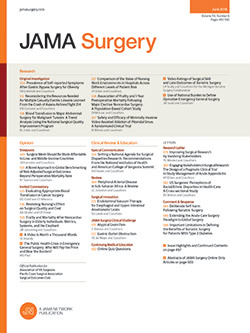 Efforts have been made to develop guidelines to determine whether a patient should undergo metastasectomy via a thoracoscopic or thoracotomy approach.21 It has been suggested that patients with a small solitary lesion detected during preoperative imaging should be candidates for thoracoscopic metastasectomy. It is true that we were more likely to find additional metastatic lesions in patients who had a higher mean number of imaged lesions. However, 30 of the 49 resections (61%) undertaken to remove a solitary lesion detected during preoperative imaging revealed additional metastatic lesions. With regard to size of tumor, patients with a smaller tumor diameter based on preoperative imaging were more likely to have additional metastatic lesions identified at the time of metastasectomy. Unfortunately, our data did not allow us to determine whether manual palpation or visual inspection was more effective for the intraoperative detection of metastases. However, in our experience, most pulmonary metastatic lesions are located in the subpleural space and are detected manually. Detterbeck et al22 performed a literature review regarding imaging requirements in the practice of pulmonary metastasectomy. The average reported rate of pulmonary metastasis not detected on preoperative imaging was 25%. Interestingly, there was no difference in the number of lesions detected with 5-mm helical chest CT vs the high-resolution 3-mm chest CT. In our study, lesions that were missed during preoperative imaging in 26% of cases were detected with bimanual palpation and visual inspection of the lung parenchyma during pulmonary metastasectomy. In addition, in 33% of cases, the missed lesion was detected in a different lobe of the lung. Although ongoing improvements in imaging quality and technologies may eventually render manual palpation obsolete, as yet we cannot report a trend toward improved preoperative detection of pulmonary metastatic melanoma lesions (Figure 2). We therefore recommend caution when considering a thoracoscopic approach for the resection of pulmonary metastatic melanoma. Correspondence: Donald L. Morton, MD, Department of Surgical Oncology, John Wayne Cancer Institute at Saint John's Health Center, 2200 Santa Monica Blvd, Santa Monica, CA 90404 (mortond@jwci.org). Accepted for Publication: May 18, 2012. Author Contributions:Study concept and design: Kidner, Faries, and Morton. Acquisition of data: Kidner, Faries, and Morton. Analysis and interpretation of data: Kidner, Faries, Morton, and Yoon. Drafting of the manuscript: Kidner, Faries, and Yoon. Critical revision of the manuscript for important intellectual content: Kidner, Faries, and Morton. Statistical analysis: Kidner and Yoon. Obtained funding: Morton. Administrative, technical, and material support: Morton. Study supervision: Faries and Morton. Funding/Support: This study was supported in part by grant P01 CA12582 from the National Institutes of Health (to Dr Morton [principal investigator]) and by funding from the John Wayne Cancer Institute Auxiliary (Santa Monica, California), the Dr Miriam and Sheldon G. Adelson Medical Research Foundation (Boston, Massachusetts), and the Melanoma Research Alliance (Washington, DC). Disclaimer: The content is solely the responsibility of the authors and does not necessarily represent the official view of the National Cancer Institute or the National Institutes of Health. Previous Presentation: This paper was presented at the 83rd Annual Meeting of the Pacific Coast Surgical Association; February 18, 2012; Napa Valley, California, and is published after peer review and revision.